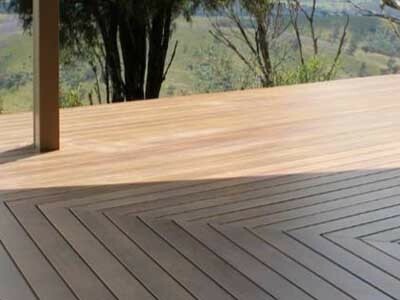 DecoDeck timber look aluminium decking from DECO is designed as a simple Do-It-Yourself system that allows even beginners to install a complete deck on their own. Installing a deck as a DIY project will save homeowners a considerable amount of money in home building or renovation projects. With a useful installation guide for the DecoDeck system from DECO, any homeowner can install the decking with only minimal tooling and expertise required. The DecoDeck decking system utilises a basic clip and screw system. Installation instructions are available for download complete with helpful diagrams. Free installation support is also provided on the phone by the DecoDeck team. DecoDeck timber look aluminium decking offers several benefits over timber decking products. Unlike timber decking, DecoDeck never needs painting or staining throughout the long life of the product. The timber finish is a high quality powder coating with high resilience to harsh environmental conditions such as direct sunlight, salt spray and industrial pollution. DecoDeck can also be used in BAL-40 or BAL FZ bushfire prone areas as all the components are non-combustible. For those who seek a professional installation, DecoDeck offers installers across New South Wales, Victoria and Queensland. Download a copy of the DecoDeck installation guide for your DIY project.